The Infinix Hot is currently the second smartphone from Infinix to run on Android 4.4.2 (KitKat). This is one of the most affordable smartphone in Africa. Infinix Has unveiled the much hyped Infinix HOT X507. The device was unveiled at event in Protea Hotel , Ikeja , Lagos ; in the presence of Bloggers , Media Gurus and Tech Enthusiasts. 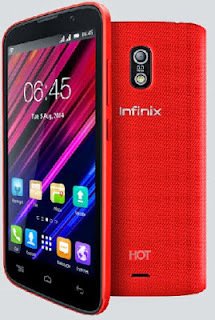 The Infinix Hot X507is a new amazing product from Infinix mobile which recently landed with amazing features that might make you ditch your current handset. The android phone has a slim rectangular design smartphone with slightly rounded corners like its predecessor. Infinix Hot X507 is running on Google android operating system Android 4.4 KitKat, 1.4GHz Quad-core,dual sim support, large display of 5.0 inches touchscreen with a dual camera of 5MP camera with LED flash and 2MP front camera designed for video calls. The android powered mobile phone comes with 1GB ram support and a powerful 3G network with with 16,000,000 colors and pixel density of 401ppi, the mobile device is perfect.